Nottingham Forest saw their unbeaten league record come to an end as Leeds avenged last season's 7-3 defeat. El Hadji Diouf frequently caused problems for the visitors and his cross fell for Luciano Becchio to score his seventh goal of the campaign. 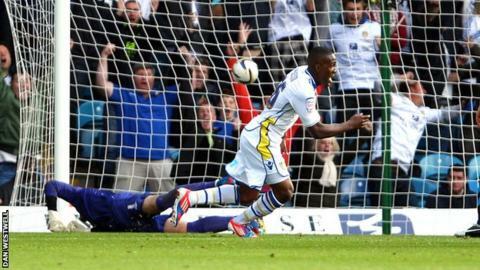 Diouf then threaded a pass through for Becchio and though he dallied, Dominic Poleon swept in his first senior goal. Forest had rarely threatened but pulled one back when Dexter Blackstock headed in following Greg Halford's long throw. After Becchio's opener, Diouf, equally effective on the wing or up front, shot weakly after collecting a Poleon lay-off but 19-year-old Poleon, in his first start for Leeds, stroked in from 12 yards. Leeds, seeking to avoid a third successive league defeat, could have been out of sight at the break, but Becchio blazed over from six yards. Indeed the home side found themselves under pressure as keeper Paddy Kenny lost Halford's throw in the sun, which allowed Blackstock to reduce the deficit. The teams have now played 86 competitive matches and this win edges Leeds ahead 29-28, with 29 matches drawn. The visitors pursued the long throw tactic and Kenny needed to scramble to tip another Halford set piece over the bar. In the closing stages Kenny was called into action again, sprawling across his line to keep out a curling effort from Lewis McGugan. Forest peppered the Leeds defence with crosses but even with the addition of six minutes of stoppage time they could not find an equaliser as both teams finished the afternoon in mid-table on 10 points.